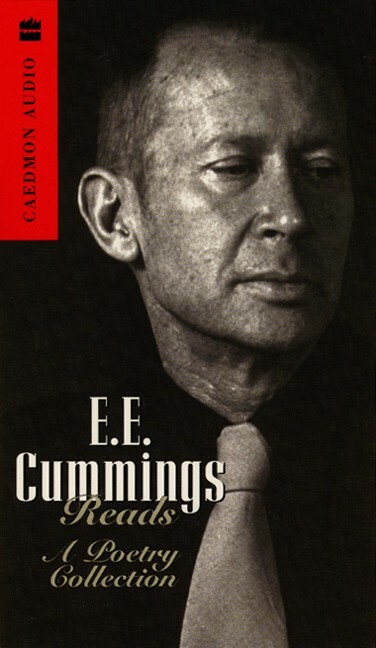 With the exception of the six nonlectures, this three-cassette collection brings together all Caedmon recordings of Cummings reading his own poetry and prose. The first cassette is the same as the first Caedmon recording, E. E. Cummings Reading His Poetry. This recording was made in the studio on May 28, 1953. Side one features selections from Him, EIMI, and Santa Claus, while the side two features poems from XAIPE (1950), 1 X 1 (1944), and 50 Poems (1940). This LP was re-released in 2007 in CD format under the name The Essential E. E. Cummings, but it is no longer in print. This new Caedmon album—one of two devoted to the readings of E. E. Cummings (TC 2080/2081)—has been compiled from more than a dozen taped recordings of the poet’s public performances. Carefully preserved by his wife, the late Marion Morehouse, the readings date from 1953 to 1961 and include Cummings’ appearances at the YMHA Poetry Center, Harvard University, the University of Rochester, the University of Chicago, the Metropolitan Museum of Art, Columbia University, McGill University, Johns Hopkins University, Oberlin College, Eastern Michigan University and the Library of Congress. The works recorded were published between 1920 and 1958 with an emphasis, as might be expected, upon the later years. All told there are five prose works and 85 poems. Though the three-cassette collection contains excerpts taken from i: six nonlectures, the recordings of the nonlectures have not been re-issued. It should not be surprising that Cummings avoids reading his visual poems; after all, he himself wrote that "not all of my poems are to be read aloud—some . . . are to be seen & not heard" (Letters 267). For a complete list of readings on E. E. Cummings Reads: A Poetry Collection (2001), see below. Order EEC Reads from Amazon.com.